Description: 1078 being pushed out of West Hingham by 1120. 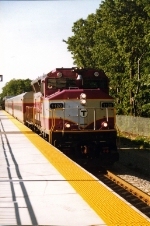 Description: 1120 pushes 1078 out of West Hingham. Description: 1120 waits another 20 minutes before departing with 2035 for Kingston. 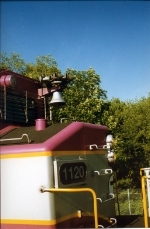 Description: Side profile of MBTA GP40MC 1120. Description: GP40MC 1120 pulls into South Weymouth with outbound 1037. Description: Outbound commuter running wrong hand main during the Merrimack Bridge construction. Description: Outbound commuter departing Haverhill. 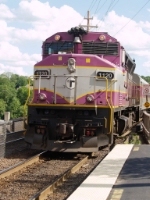 Description: UP, MBTA, NS, and primer all in one frame.